Dentsu Aegis Network is one of the largest advertising agency networks in the world. Serving leading brands like Mastercard, United Airlines and National Geographic, means they always need to stay ahead of their consumers, setting global standards in data-driven creativity. But every client is different. When one organization came to the Philippines team with a proposition far from their usual type, they needed to think outside the box. Here’s how they did it. Helping a traditional market cover new ground. Compared to many others, the Philippines is still a very traditional market, yet to evolve into a truly digital landscape. Despite this, the Dentsu team on the ground was seeing the B2B market undergo a thriving digital transformation, and many other industries were keen to follow suit. “One of our goals here at Dentsu, especially in the Philippines, is to expand our definition of ‘clients’ outside of the typical CMOs and brands we usually speak to”, says Bea Atienza, Chief Strategy Officer, Dentsu, Philippines, whose primary role is to help the agency evolve into a more data-driven organization. Presenting the agency with a new kind of client who didn’t see themselves as a brand, the school was keen to understand its students in a more data-driven way. They wanted to understand more about the youth of today so they could make decisions more geared towards them, not just in terms of recruitment, but in terms of student engagement, and training their own faculty. As an organization that wouldn’t have leveraged a lot of data in the past, this was new territory. The team needed a way to gather and present this insight in a way that would be easily understandable and actionable for the school. Painting a data-driven picture of the youth of today. Bea explains how this partly comes down to increasing use of social media through which the “perfect” image is projected and the pressure to be popular intensifies. “For this reason, schools are very interested in hearing how kids cope with pressure”, she says. How do they deal with stress and pressure? How do they view the role of technology in their lives? These were all questions the school needed answers to, so the team set out to find them. Using GlobalWebIndex, the intuitive analysis platform that offers access to the world’s largest survey on the online consumer, they started by looking closely at Generation Z, then analyzing how these youths compared to other segments. With the ability to deep-dive into far more than just their online behaviors, but their attitudes, interests, motivations and more, they could develop a more in-depth, holistic understanding of the audience. Along with the network’s own people-based identity and data platform, M1, they could gather unique insight into the relationships between consumers, brands and media. But this wasn’t the only thing the team was focused on. In the age of information, there’s a growing need for schools to offer more than just education. With a steady stream of information at their fingertips, how are these youths using the internet, and what needs and motivations do they have beyond this? Focusing on data around internet usage, the team uncovered some interesting takeaways. 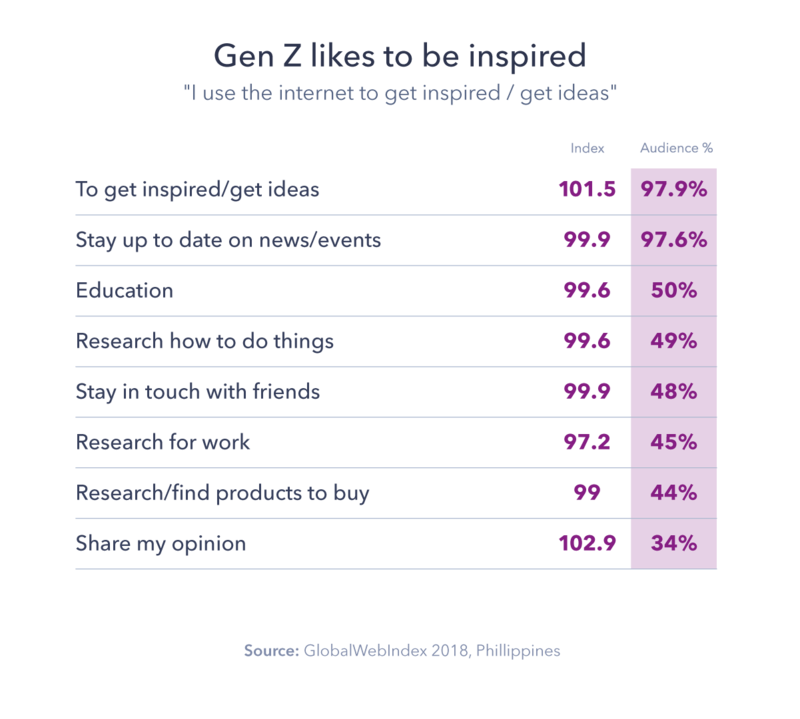 Looking at some of the data from GlobalWebIndex, the team also found that one of their top internet motivations is to ‘get inspired and get ideas’. This corroborated their other insights, revealing a pattern of thinking and behavior unique to this group. 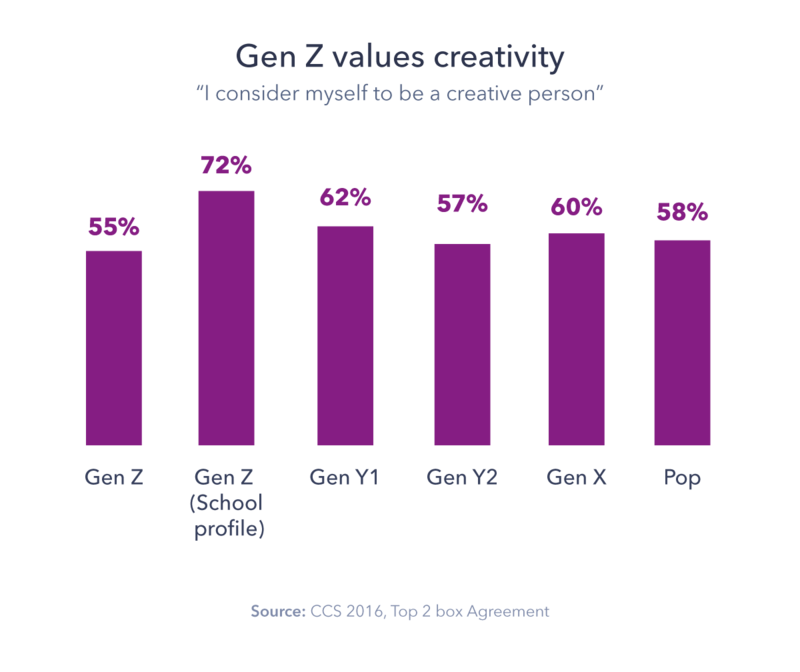 What’s more, when comparing Gen Z to other generations, particularly in the top income bracket, the team uncovered another statement that defined this group: ‘I consider myself to be a creative person’. “The attitudinal statements were invaluable for us to paint a better picture of the audience." Bea explains: “In this case, the main learnings came from doing the generational comparison. It’s possible to pull out a statements like, ‘Technology makes my life more complicated’, and index that, but it doesn’t mean much by itself. It takes on a whole new meaning when you can see that Gen Z scores the lowest in agreement to that statement versus other generations. Proving the growing need for insight across the board. As a completely new project for both the client and the agency, neither was sure what to expect. But after uncovering revealing insights that the school could easily tap into, it was clear they were on to a winner. Highlighting an example, Bea explains how one teacher suggested helping the students feel more empowered by letting them take the reins on certain classes; instead of telling the students ‘this is what we’re going to do today’, they would prepare different options and let the students decide the direction. With the data sparking ideas like these, it proved to the team that their insights were highly actionable and the information was valuable. Highlighted the growing value of consumer data in education. Proved their appeal to non-traditional clients. Using GlobalWebIndex, this case not only highlighted the growing value of consumer data in education. From a business perspective, it demonstrated to the agency the wealth of opportunity that lies in pursuing partnerships that are somewhat out of the ordinary. Perhaps most importantly, this project opened up new doors, shedding light on the skills and insights needed by global organizations of all shapes and sizes as data plays a more central role in everyday success. Turning their attention to more ‘non-traditional’ businesses, Dentsu has since begun working with an educational NGO, among others, placing a renewed focus on developing new solutions developed ‘outside of the box’.